pure white, white patches or liver color. 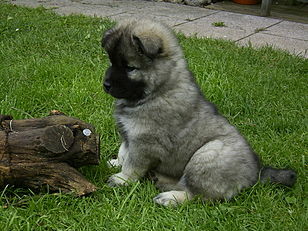 The Eurasier, or Eurasian dog, is a breed of dog of the spitz type that originated in Germany. It is widely known as a wonderful companion that maintains its own personality, has a dignified reserve to strangers, a strong bond to its family and that is relatively easy to train. The Eurasier is a balanced, well-constructed, medium-sized Spitz (Spitzen) type dog with prick ears. It comes in different colors: fawn, red, wolf-grey, solid black, and black and tan. All color combinations are allowed, except for pure white, white patches, and liver color. 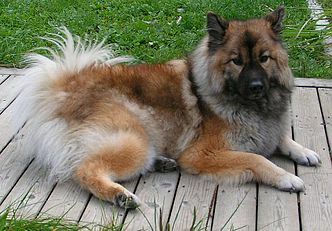 Fédération Cynologique Internationale (FCI) standards call for the Eurasier to have a thick undercoat and medium-long, loosely lying guard hair all over the body, with a short coat on the muzzle, face, ears, and front legs. The tail and the back of the front legs (feathers) and hind legs (breeches) should be covered with long hair. The coat on the Eurasier's neck should be slightly longer than on the body, but not forming a mane. The breed may have a pink, blue-black or spotted tongue. The male has a height of 52 to 60 cm (20–23.5 inches) at the withers and weighs between 23 and 32 kg (50–70 lb) and the female has a height of 48 to 56 cm (19–22 inches) at the withers and weighs between 18 and 26 kg (40–57 lb). Eurasiers are calm, even-tempered dogs. They are watchful and alert, yet reserved towards strangers without being timid or aggressive. Eurasiers form a strong link to their families. For the full development of these qualities, the Eurasier needs constant close contact with its family, combined with understanding, yet consistent, training. They are extremely sensitive to harsh words or discipline and respond best to soft reprimand. The Eurasier is a combination of the best qualities of the Chow Chow, the Keeshond, and the Samoyed (dog), resulting in a dignified, intelligent breed. Eurasiers were bred as companion dogs; as such they do poorly in a kennel environment such as those commonly used for institutionally trained service dogs, nor are they well suited for the social stresses of working as a sled or guard dog. Training should always be done through family members, not through strangers or handlers. Eurasiers should never be restricted to only a yard, kennel, crate, or chained up. They would pine and become depressed. Within these limitations, Eurasiers can work very well as therapy dogs. This breed enjoys all kinds of activities, especially if the activities involve their family. Eurasiers are calm and quiet indoors, outdoors they are lively and enjoy action. Eurasiers rarely bark but if they do, they usually have a good reason. Eurasiers originated in Germany in 1960, when the founder, Julius Wipfel, set out together with Charlotte Baldamus and a small group of enthusiasts to create a breed with the best qualities of the Chow Chow and the Wolfspitz. 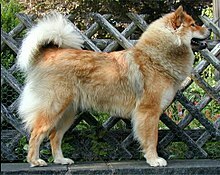 The initial combination of the breeds resulted in what was first called "Wolf-Chow" and then, twelve years later, after crossing with a Samoyed, was renamed "Eurasier" (Eurasian) and recognized by the FCI in 1973. Nobel Laureate Konrad Lorenz obtained a Eurasier puppy from Charlotte Baldamus, Nanette vom Jaegerhof, whom he called "Babett". He thought her character was the best he had ever known in a dog. 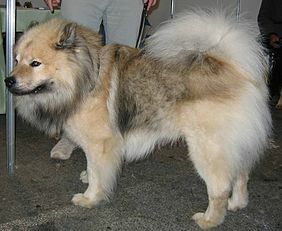 Today, unethical breeders sometimes try to pass off a Keeshond/Chow Chow mix as a Eurasier. While they are genetically similar, these mixes cannot be classified as Eurasiers. Eurasiers are still a comparatively young breed. The three Eurasier Clubs are in the German Kennel Club VDH / FCI —EKW, KZG, and ZG—therefore strongly direct[clarification needed] and supervise breeding in Germany. A group of dedicated Eurasier Clubs has joined together in the International Federation for Eurasier Breeding (IFEZ) in the FCI. Eurasier puppies bred according to these sound IFEZ guidelines receive an IFEZ certificate. The Eurasier breed was recognized by the Canadian Kennel Club (CKC) in 1995 as a member of Group 3 (Working Dogs). The Kennel Club announced in December 2012 that with effect from April 1, 2013, the Eurasier breed will transfer from the imported register to the breed register. Eurasiers are generally healthy dogs, though a small gene pool in the breed's early years has led to some hereditary diseases being seen occasionally. Known issues include hip dysplasia, luxating patella, and hypothyroidism, as well as eyelid and lash disorders such as distichiae, entropion, and ectropion. ^ "Eurasier moves from imported to breed register". Dog World (newspaper). Retrieved 5 December 2012. Annelie Feder et al., Eurasier heute. German book with English translation. Julius Wipfel, Eurasier. In this book dated 1974, Julius Wipfel outlined his ideals on how to care, keep and breed Eurasiers. For an English translation turn to the KZG. 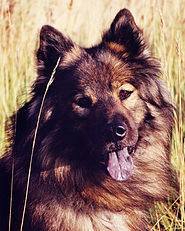 Wikimedia Commons has media related to Eurasier. This page was last edited on 2 December 2018, at 19:58 (UTC).